As the second largest city in the United States, Los Angeles is a city that many people call home. Did you know the Great Wall of Los Angeles, the world’s largest mural, can be found there? 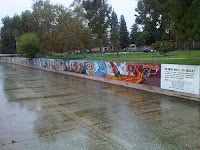 It stretches 2500 feet along the LA River in San Fernando Valley. 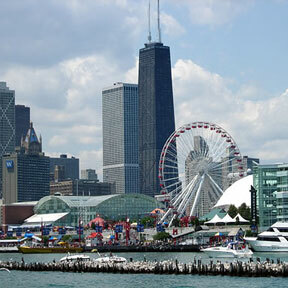 The city is home to over 300 museums which is more than any other city in the United States. LA is also the home base for the world’s largest toy manufacturer, Mattel, Inc. Perhaps Mattel’s most well known toy is Barbie who was born in LA in 1959. Other famous things born in LA include the hula-hoop, chaise lounge, space shuttle, and Mickey Mouse. What interesting people, places, or things “live” in your city? Let us know! As the largest city in the United States, New York City is inevitably the place where a lot of things occurred for the first time. The New York Post is the oldest printed daily newspaper in the United States and was established in 1803. New York was also the first city to require cars to have license plates and was the first capital of the United States from 1789 to 1790. New York is also known for various landmarks throughout the city, the most famous, perhaps, being the Statue of Liberty. Lady Liberty was presented to the United States from the French on July 4, 1884 but it was not until 1886 that the statue was fully reconstructed in New York. The Statue of Liberty is 152 feet tall from base to torch and weighs 450,000 pounds. She also has a 35 foot waist and an 8 foot long index finger! When Ellis Island opened on January 1, 1892, the Statue of Liberty became more then just a gift from France. 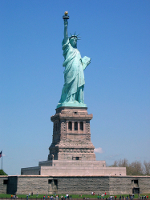 To many immigrants traveling to the United States the statue symbolized hope and welcomed them to their new life. From 1892 to 1924 12 million immigrants passed through Ellis Island to begin a new life in the United States. What historical landmark is your city known for? Let us know! Chicago is home to many interesting attractions, but perhaps one of its most interesting sights is the Chicago River, which flows through the center of the city and right past the offices of the ABE! 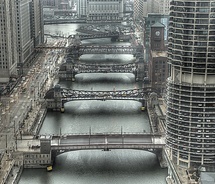 The Chicago River is the only river in the world that flows backwards! In 1900 the direction of the river was changed to prevent it from flowing into Lake Michigan and contaminating the source of the city’s water supply. Instead, the river now flows into the Des Plaines River which eventually connects to the Mississippi River, making it the first and only river to have its direction successfully reversed! Do you have a fun fact from your city or town you want to share? Let us know. Willis Tower (previously known as the Sears Tower) and John Hancock building, two of the tallest in the country. Chicago is also the hometown of the current leader of our country, President Barack Obama. What famous people are from your city or town? How about famous attractions? Let us know.